Philippines sweeps 2017 SEABA Championship after Gilas defeats Indonesia - Balita Boss! 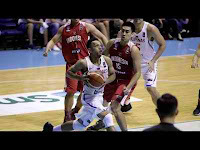 The Philippine men's national basketball team Gilas Pilipinas got the lone ticket to represent Southeast Asia in the 2017 FIBA Asia Cup in Lebanon in August after defeating Indonesia 97-64 in the final day of 2017 SEABA Championship on May 18. The Gilas Pilipinas will now move on to the FIBA Asia Cup in August and the 2019 FIBA World Cup Asian Qualifiers in November. This is the fifth SEABA Championship title for Philippines in the last six editions. Andray Blatche led Gilas Pilipinas with 21 points and 10 rebounds. Jayson Castro contributed 14 points, 7 rebounds and 5 assists for his best game of the tournament. June Mar Fajardo added 13 points, four boards, and two blocks for the Philippines. It was a tough ending for a impressive run for Indonesia who had a perfect record before the matchup. Gilas Pilipinas was simply too much for Indonesia. The host team composed of PBA players and a naturalized player had a 53-25 advantage in rebounding, including a 21-8 edge on offensive boards. They also scored 28 second-chance points against only 12 for visiting team. Arki Wisnu topscored for Indonesia with 11 points while Mario Wuysang added 10. Naturalized forward Jamarr Johnson, a 6-foot-5 naturalized player, struggled for only four points on 2-of-6 shooting.